Aortic valve insufficiency results from leakage and backflow of blood that is ejected from the left ventricle (LV) into the ascending aorta back into the left ventricle. Many mechanisms contribute to aortic valve insufficiency. These include abnormalities of the aortic valve leaflets and pathologies of the proximal aortic root. This article primarily focuses on aortic valve insufficiency caused by abnormalities in the aortic valve leaflets. The aortic valve is composed of 3 thin leaflets (ie, cusps) that project from the wall of the proximal ascending aorta. These leaflets and their respective sinuses of Valsalva are termed left, right, and noncoronary. In the embryonic stage, the truncus arteriosus connects to the dorsal aspect of the aorta via 6 pairs of aortic arches. The separation of truncus arteriosus into 2 great arteries results from the fusion of the aorticopulmonary septum and the truncus septum. The semilunar valves and their related sinuses are created by absorption and the hollowing out of tissue at the distal side of the truncus ridges. Many mouse single-gene-knockout models of truncus arteriosus have been reported (eg, Sox4 null, Tbx1 null, pax3Splotch), although only NFATc1 null and Sox4 null display absent semilunar cusps. Ablation of a particular region in the cranial neural crest also results in truncus arteriosus, at least in the chick. Aortic valve insufficiency can be due to, or associated with, congenital heart disease. Recently, the percentage of individuals with aortic valve insufficiency caused by aortic root disease has been steadily increasing compared with the percentage of those with valvular disease. In fact, more than half of patients who present with pure aortic regurgitation (AR) without any associated cardiac anomalies have aortic valve insufficiency caused by aortic root disease. See the image below. Aortic regurgitation. 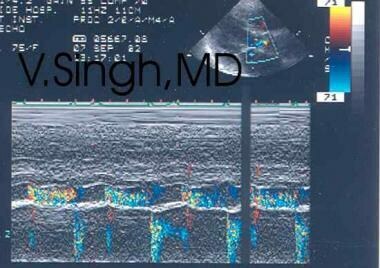 Color Doppler echocardiogram. In long-standing aortic regurgitation, this compensatory mechanism begins to deteriorate. When LV function cannot continue to compensate for volume overload, the LV dilates, and LV end-diastolic volume increases, even without further increase in aortic regurgitation volume. The LV thickness–to–chamber size ratio decreases. This causes an increase in systolic wall tension and a decrease in ejection fraction, stroke volume, and ventricular emptying. This larger end-systolic volume leads to progressively larger end-diastolic volume. With progressive increases in wall tension, a mismatch occurs between oxygen demand and supply. Supply, which is always abnormally tenuous because of the lower-than-normal coronary driving pressure (difference in aortic diastolic pressure and ventricular diastolic pressure), cannot keep up with the increased demand. Interstitial fibrosis begins to occur, reducing wall compliance and further increasing end-diastolic LV pressure. If untreated, this interstitial fibrosis leads to elevated left atrial pressure and pulmonary venous congestion, especially during exercise. Ventricular ectopy is another manifestation of the oxygen supply-demand mismatch. In acute severe aortic valve insufficiency due to endocarditis or sudden trauma, the LV cannot immediately respond with increased stroke volume to facilitate proper emptying because the element of eccentric hypertrophy is missing. As a result, LV diastolic pressure suddenly rises. Volume overload in the LV results in an early closure of the mitral valve during diastole. This occurs as a natural defense mechanism to protect the pulmonary venous system from the high-pressure regurgitant backflow coming from the high-pressure LV chamber. Systolic pressures remain effectively unchanged in the aorta and the LV. Because of the increase in LV diastolic pressure, the pulse pressure may not significantly widen in acute severe aortic valve insufficiency. Tachycardia and early closure of the mitral valve are the compensatory mechanisms here. The 5-year survival rate is approximately 75%. The 10-year survival rate is approximately 50%. Progression to symptoms, LV dysfunction, or both occurs in fewer than 6% of patients per year. Progression to asymptomatic LV dysfunction occurs in fewer than 3.5% of patients per year. Sudden death occurs in fewer than 0.2% of patients per year. Asymptomatic patients with LV systolic dysfunction: Progression to cardiac symptoms occurs in more than 25% of patients per year. Symptomatic patients: The mortality rate is higher than 10% per year. Most findings in patients with aortic valve insufficiency are related to LV volume overload and eventual myocardial dysfunction. Individuals with chronic aortic valve insufficiency may be asymptomatic for several years. This is because of adaptation of the LV to the pressure dynamics generated from long-standing volume overload. Many patients with chronic aortic valve insufficiency are no longer in the pediatric age group by the time signs and symptoms appear. However, in acute severe aortic valve insufficiency, the LV does not have the ability to adapt to sudden volume overload resulting from aortic valve insufficiency. In this setting, LV failure and cardiac collapse occur. They are manifested as chest discomfort, dyspnea, and hypotension. An estimated 5 million Americans have at least one form of heart valve disease. In 2000, 1 million Americans were affected by congenital heart disease. This is a 3-fold increase from 300,000 in 1980. This figure is projected to increase to 1.4 million in the year 2020. Risk of premature death, complications, and the need for medication because of congenital heart disease is at least 50%. In approximately two thirds of patients with aortic regurgitation, the disease is rheumatic in origin, resulting in thickening, deformation, and shortening of the individual aortic valve cusps. This leads to changes that prevent their proper opening during systole and closure during diastole. A rheumatic origin is less common in patients with isolated aortic regurgitation. Data are similar to those of the United States. Acute rheumatic fever is associated with varying degrees of valvulitis and myocarditis. A New Zealand study focused on LV mechanics during and after acute rheumatic fever. The study found that the contractile dysfunction during and after acute rheumatic fever evolves in a manner dependent on the degree and type of aortic valve insufficiency and may be influenced by surgical intervention. The study concluded that mechanical factors are the most important contributors to myocardial damage during and after an episode of acute rheumatic fever in children. In patients with chronic aortic valve insufficiency, in whom LV diastolic function remains stable and compensatory mechanisms have evolved over time, the presence of a new acute lesion may adversely affect the LV dysfunction. This can have a significant impact on valve function and blood flow dynamics and may ultimately facilitate decompensation. Therefore, even a person with compensated chronic severe aortic valve insufficiency should be considered at a high risk of decompensation with respect to life-threatening cardiac complications. Furthermore, because of the lower-than-normal coronary driving pressure, patients with severe aortic valve insufficiency are difficult to successfully resuscitate following cardiovascular collapse. Most natural history data are from the adult population with a history of several years of aortic valve insufficiency. According to these data, in patients who have angina, the 5-year survival rate of uncorrected severe aortic valve insufficiency is 50%. Once syncope develops, almost 50% of patients who do not undergo correction die within 3 years. Once heart failure develops, 50% of uncorrected patients die within 2 years. Compare this with an approximate 1-5% mortality rate in patients with surgical correction. Approximately three fourths of patients with pure or predominant aortic valve insufficiency are males. In patients who have associated mitral valve disease, the incidence is higher in females than in males. Other than aortic valve insufficiency associated with congenital heart disease, the incidence of aortic valve insufficiency is not age related. Hanedan Onan S, Baykan A, Sezer S, et al. Evaluation of Cardiovascular Changes in Children with BAVs. Pediatr Cardiol. 2015 Nov 20. [Medline]. Gentles TL, Colan SD, Wilson NJ, et al. Left ventricular mechanics during and after acute rheumatic fever: contractile dysfunction is closely related to valve regurgitation. J Am Coll Cardiol. 2001 Jan. 37(1):201-7. [Medline]. Lowenthal A, Tacy TA, Behzadian F, Punn R. Echocardiographic predictors of early postsurgical myocardial dysfunction in pediatric patients with aortic valve insufficiency. Pediatr Cardiol. 2013 Aug. 34(6):1335-43. [Medline]. Scognamiglio R, Rahimtoola SH, Fasoli G, et al. Nifedipine in asymptomatic patients with severe aortic regurgitation and normal left ventricular function. N Engl J Med. 1994 Sep 15. 331(11):689-94. [Medline]. Pasquali SK, Shera D, Wernovsky G, et al. Midterm outcomes and predictors of reintervention after the Ross procedure in infants, children, and young adults. J Thorac Cardiovasc Surg. 2007 Apr. 133(4):893-9. [Medline]. Kouchoukos NT, Masetti P, Nickerson NJ, et al. The Ross procedure: long-term clinical and echocardiographic follow-up. Ann Thorac Surg. 2004 Sep. 78(3):773-81; discussion 773-81. [Medline]. Brancaccio G, Polito A, Hoxha S, Gandolfo F, Giannico S, Amodeo A, et al. The Ross procedure in patients aged less than 18 years: The midterm results. J Thorac Cardiovasc Surg. 2013 Mar 12. [Medline]. Elkins RC, Lane MM, McCue C. Ross operation in children: late results. J Heart Valve Dis. 2001 Nov. 10(6):736-41. [Medline]. Lupinetti FM, Duncan BW, Lewin M, Dyamenahalli U, Rosenthal GL. Comparison of autograft and allograft aortic valve replacement in children. J Thorac Cardiovasc Surg. 2003 Jul. 126(1):240-6. [Medline]. Elkins RC, Knott-Craig CJ, McCue C, Lane MM. Congenital aortic valve disease. Improved survival and quality of life. Ann Surg. 1997 May. 225(5):503-10; discussion 510-1. [Medline]. Luciani GB, Favaro A, Casali G, Santini F, Mazzucco A. Ross operation in the young: a ten-year experience. Ann Thorac Surg. 2005 Dec. 80(6):2271-7. [Medline]. Takkenberg JJ, van Herwerden LA, Eijkemans MJ, Bekkers JA, Bogers AJ. Evolution of allograft aortic valve replacement over 13 years: results of 275 procedures. Eur J Cardiothorac Surg. 2002 Apr. 21(4):683-91; discussion 691. [Medline]. Cox DA, Walton K, Bartz PJ, Tweddell JS, Frommelt PC, Earing MG. Predicting left ventricular recovery after replacement of a regurgitant aortic valve in pediatric and young adult patients: is it ever too late?. Pediatr Cardiol. 2013 Mar. 34(3):694-9. [Medline]. d'Udekem Y, Siddiqui J, Seaman CS, Konstantinov IE, Galati JC, Cheung MM, et al. Long-term results of a strategy of aortic valve repair in the pediatric population. J Thorac Cardiovasc Surg. 2013 Feb. 145(2):461-7; discussion 467-9. [Medline]. Bolen JL, Alderman EL. Hemodynamic consequences of afterload reduction in patients with chronic aortic regurgitation. Circulation. 1976 May. 53(5):879-83. [Medline]. Bonow RO, Carabello B, de Leon AC, et al. ACC/AHA Guidelines for the Management of Patients With Valvular Heart Disease. Executive Summary. A report of the American College of Cardiology/American Heart Association Task Force on Practice Guidelines (Committee on Management of Patients With Val. J Heart Valve Dis. 1998 Nov. 7(6):672-707. [Medline]. Bonow RO, Dodd JT, Maron BJ, et al. Long-term serial changes in left ventricular function and reversal of ventricular dilatation after valve replacement for chronic aortic regurgitation. Circulation. 1988 Nov. 78(5 Pt 1):1108-20. [Medline]. Bonow RO, Rosing DR, Maron BJ, et al. Reversal of left ventricular dysfunction after aortic valve replacement for chronic aortic regurgitation: influence of duration of preoperative left ventricular dysfunction. Circulation. 1984 Oct. 70(4):570-9. [Medline]. Braunwald. Heart Disease: A Textbook of Cardiovascular Medicine. 1997. Vol 1: 1045-60. Cameron DE. Surgical techniques. Ascending aorta. Cardiol Clin. 1999 Nov. 17(4):739-50. [Medline]. Carabello BA. Vasodilators in aortic regurgitation--where is the evidence of their effectiveness?. N Engl J Med. 2005 Sep 29. 353(13):1400-2. [Medline]. David TE, Ivanov J, Armstrong S, Feindel CM, Webb GD. Aortic valve-sparing operations in patients with aneurysms of the aortic root or ascending aorta. Ann Thorac Surg. 2002 Nov. 74(5):S1758-61; discussion S1792-9. [Medline]. Ekery DL, Davidoff R. Aortic regurgitation: quantitative methods by echocardiography. Echocardiography. 2000 Apr. 17(3):293-302. [Medline]. Elkins RC. The Ross operation: applications to children. Semin Thorac Cardiovasc Surg. 1996 Oct. 8(4):345-9. [Medline]. Fioretti P, Benussi B, Scardi S, et al. Afterload reduction with nifedipine in aortic insufficiency. Am J Cardiol. 1982 May. 49(7):1728-32. [Medline]. Grande KJ, Cochran RP, Reinhall PG, Kunzelman KS. Mechanisms of aortic valve incompetence: finite element modeling of aortic root dilatation. Ann Thorac Surg. 2000 Jun. 69(6):1851-7. [Medline]. Greenberg BH, DeMots H, Murphy E, Rahimtoola S. Beneficial effects of hydralazine on rest and exercise hemodynamics in patients with chronic severe aortic insufficiency. Circulation. 1980 Jul. 62(1):49-55. [Medline]. Grocott-Mason RM, Lund O, Elwidaa H, et al. Long-term results after aortic valve replacement in patients with congestive heart failure. Homografts vs prosthetic valves. Eur Heart J. 2000 Oct. 21(20):1698-707. [Medline]. Harris KM, Malenka DJ, Haney MF, et al. Improvement in mitral regurgitation after aortic valve replacement. Am J Cardiol. 1997 Sep 15. 80(6):741-5. [Medline]. Ismailov RM, Weiss HB, Ness RB, et al. Blunt cardiac injury associated with cardiac valve insufficiency: trauma links to chronic disease?. Injury. 2005 Sep. 36(9):1022-8. [Medline]. Katz NM. Current surgical treatment of valvular heart disease. Am Fam Physician. 1995 Aug. 52(2):559-68. [Medline]. Levine HJ, Gaasch WH. Vasoactive drugs in chronic regurgitant lesions of the mitral and aortic valves. J Am Coll Cardiol. 1996 Nov 1. 28(5):1083-91. [Medline]. Pasquali SK, Cohen MS, Shera D, et al. The relationship between neo-aortic root dilation, insufficiency, and reintervention following the Ross procedure in infants, children, and young adults. J Am Coll Cardiol. 2007 May 1. 49(17):1806-12. [Medline]. Shah PM, Graham BM. Management of aortic stenosis: is cardiac catheterization necessary?. Am J Cardiol. 1991 May 1. 67(11):1031-2. [Medline]. Shiota T, Jones M, Aida S, et al. Calculation of aortic regurgitant volume by a new digital Doppler color flow mapping method: an animal study with quantified chronic aortic regurgitation. J Am Coll Cardiol. 1997 Sep. 30(3):834-42. [Medline]. The authors and editors of eMedicine gratefully acknowledge the contributions of Samuel Ritter, MD, to the original writing and development of this article.